Music Spooky Scraps! Don't Get Spooked! Spooky Scraps! Don't Get Spooked! is the sixth level of World 4 in Yoshi's Woolly World. The level begins in an area with many transparency sheets, which reveal platforms and beads but make enemies invincible. 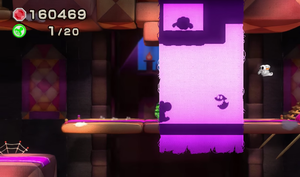 After two Boo Guys, Yoshi will encounter more transparency sheets, a few Wiks, and yet even more transparency sheets leading to a door, which in turn leads to the first checkpoint. More transparency sheets follow, with a few ropes leading to secret areas. The final secret area contains a key, which Yoshi must use to unlock the Locked Door afterwards, leading to the second checkpoint. The next segment of transparency sheets continually move to give that portion of the level an autoscrolling feel, complete with more Boo Guys and Wiks. This segment continues until the next door, which leads straight to the goal roulette. Smiley Flower 1: In a Winged Cloud just before the first door. Smiley Flower 2: In a hidden Winged Cloud below the Egg Block after the first checkpoint. Smiley Flower 3: In a door in the secret area up a rope near the key door. Once inside, Yoshi must traverse the transparency sheet upwards to the Smiley Flower. Smiley Flower 4: Immediately after the fourth Wonder Wool, in a transparent alcove. Yoshi must grab it from the right. Smiley Flower 5: Just before the final door, Yoshi must grab a rope and climb down to a secret door, which leads directly to the Smiley Flower. Wonder Wool 1: Just after the first two Boo Guys, suspended below in midair. Yoshi must wait until the transparency sheets expose a platform that can be used to collect it. Wonder Wool 2: In a secret area at the top just before the first door (accessible via the top platform seen behind the spooky scrap). Wonder Wool 3: Up the second rope. To unveil it, Yoshi must first clear out all six of the Boo Guys that appear when entering the secret area. Wonder Wool 4: Just below a row of visible breakable blocks in the area after the second checkpoint. Wonder Wool 5: Unveiled after touching the exclamation circle when one of the sheets floats upward permanently. 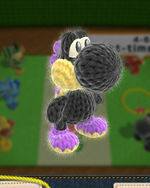 Collecting all of the Wonder Wools knits Nighttime Yoshi (known as Night-time Yoshi in PAL regions) back together. This page was last edited on January 24, 2019, at 13:00.